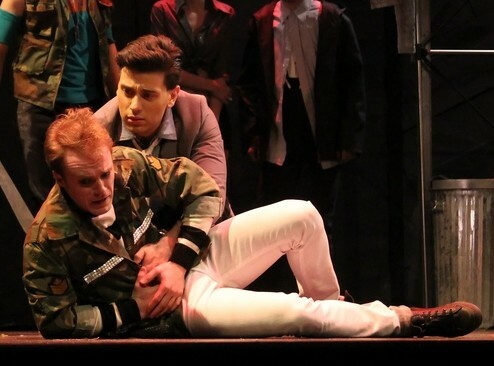 A Best Supporting Actor in a Regional Production Nominees this year for his turn in Romeo & Juliet at Hart House, Joshua took the time to answer our most pressing Mercutio-related questions (and a few others). I saw my dad in a community theatre production of Annie when I was very young, maybe five or six years old. I don’t really remember seeing the show, but I can remember my dad’s face in makeup. Magic. I do remember the first production I saw that really blew me away. It was on a school trip to Stratford. The show was Who’s Afraid of Virginia Woolf? with Martha Henry and Peter Donaldson. I was about 15 and still considered myself primarily a dancer. It was the first time I saw a specificity and a freedom in theatre that I had never seen in classical dance. I walked out of that theatre cracked right open, we all did. The bus home was buzzing with 40 kids trying to process what we’d seen and how we were feeling. I don’t think any of us shut up the entire ride. That’s when I decided this was something I wanted to do. Where did you study/develop as an actor? I studied at the University of Windsor, and went to an arts high school called Huron Heights in Newmarket. I feel like a bit of a dork talking about my high school drama program, I guess because people never do, but in terms of encouraging me to develop as an artist, it was just as important a time as university. I grew up in a small town in the prairies that was much less encouraging of self-expression, so it was unbelievable to me to come out here as a teenager and find a like-minded community of theatre nerds and attention seekers. Oh lord, I don’t know. My parents still think the best thing I’ve ever done was a student production of The Day Billy Lived when I was 16. For real, they talk about it after every show they come see. I think the best compliment I got during R&J was from my Dad, he told me it was the best thing he’d seen me do since that show. It’s great. My biggest competition in their eyes is me when I was 16. One day? Lear. Richard III. Hamlet. Willy Loman. George in Who’s Afraid… Teach from American Buffalo. Soon? Austin in True West, Hal, Richard II, Hart in Unity 1918 and I’d like to give Romeo a crack before my hair’s too thin for it. I feel like this is a question I’ll be able to answer better 10 years from now. I think I’m still young enough to say that every one of the directors and actors I’ve worked with have had a major influence on me. Had you played much Shakespeare before Romeo & Juliet? Yes and No. Of course we studied it at school, and I’ve been in love with it for a long time, but this was (as far as I can remember) my first full-length, non-workshop Shakespeare production. What was it like working with Jeremy Hutton? How did his ideas about the role mesh with your own? Jeremy’s great. He’s very intelligent, and specific about what he’s looking for, while at the same time inviting open collaboration. I feel very grateful that he came into my artistic life when he did. He’s also direct, which I like. I like direct. As far as his ideas about the role vs. my own, I take it as a good sign that I’m not really sure looking back which ideas were his and which were mine. Most of the good ones were probably his. Mercutio’s one of the most famous roles in English-speaking theatrical history. A) How did you deal with that kind of pressure? B) How did you make the role your own? C) Did you consult any of the famous interpretations to help you? I’m gonna answer those in reverse order. First off, no, I didn’t look at anyone else’s interpretations. Do people do that? I’ve never known any actor who actually WANTS to look at someone else’s work on the role as part of their process. I’ve been meaning to re-watch the Zeffirelli film now that the show’s over, but the last thing I want while I’m working is someone else’s voice saying the lines inside my head. As far as making the role my own, I think that’s about discovery, and authenticity. You find out what the words mean to you, what they mean to the action of the scene, and once you figure out what you’re doing, you try and do it with some life, some danger in it. When it’s at its best, when you can manage to get out of your own way; it can’t help but be unique to you because you’re not pulling any strings. You’re not removed from it, you’re in it, you let you surprise yourself. Or you let your self surprise you. I think I just broke my brain. NEXT! In terms of pressure, it kind of comes with the territory. I’m sure people deal with it differently. Getting in front of an audience and remembering how great that is helps. Other than that, for me it’s basically freak out, relax, repeat. The Queen Mab speech can be a killer. How did you approach making heads or tails of it? One phrase at a time. I came in the day we got that on its feet and Jeremy immediately started demanding more specificity in each of the images. I knew that I didn’t want to make it too silly, wanted to feel the danger in the darker parts of it, and he was a big ally in nudging me off that cliff, giving me permission to go there. It was also such a blessing to have an actor as generous as Paolo [Santalucia, Romeo] there every night, looking right back at me. The guy was always present, always looking me right in the eye, and that’s a gift. We’ve all seen the speech done different ways, and I think the danger is in losing the argument of it. I think it sometimes gets turned into a piece of craziness that doesn’t mean anything besides “Mercutio’s batty.” Yes, he goes nuts. Yes, he loses control. Yes, it’s an interminable list of examples. But what gets lost sometimes is that all the silly stuff, the scary stuff, and the bawdy stuff is supporting his final point to Romeo: his “idle brain” and “vain fantasy” are nothing, and more than that, they’ll be the end of him. How does one effectively die onstage while giving a big pun-y speech? The images in that scene are a lot like the images in Mab, you’ve got to use them for something. Mercutio tries to make light of his wounds, even as he dies, it’s a coping mechanism. No hesitation: Jeremy LaPalme [Benvolio]’s face in my crotch, night after night. I think we were all quite shocked at how great the ensemble on R&J was. There were 23 of us, and that green room was always a pleasant and exciting place to be with very little ego-flexing or bitchery. So yeah, the cast of that show. My favourites. Yeah, super flattered to be nominated for an award. I think we all try very hard to minimize our need for external validation because so much great work by so many people goes unnoticed; the work has to be its own reward. But we’re all human, and it’s really nice to be recognized. So thanks a lot.